You save $2.00 — $5.04 (10% — 17%)! The most educationally sound gardening book available anywhere has now become even better!. Brand New in 2017! co-authored by James B. Kennard, with many revisions, updates, and improvements, 149 color photos demonstrating every step in the gardening process, and dozens of new and improved illustrations throughout, making learning quicker, easier, and even more enjoyable. The best gardening book on the planet is now the last gardening book you will ever need! 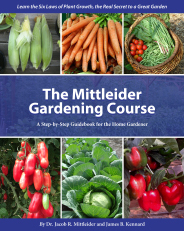 The first printing was a collaboration between several BYU Educators and Dr. Mittleider, and this edition has the benefit of an additional 19 years’ experience and wisdom, plus the collaboration of many experienced Certified Mittleider Growers. 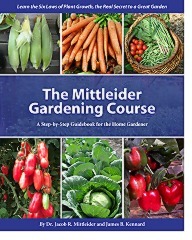 Provides simple straight-forward instruction and illustrations on every element of the Mittleider System of growing, enhanced with color pictures and improved illustrations. Teaches all the basic topics plus 15 advanced topics, such as cold-weather gardening, pruning for maximum yields, growing plants vertically, solutions to common gardening problems such as controlling bugs and diseases, understanding fertilizers, home seedling production, building an inexpensive greenhouse and more. Download Chapter 16: Automated Watering (PDF, 733 KB) and learn how to install a simple PVC Mittleider Watering System.